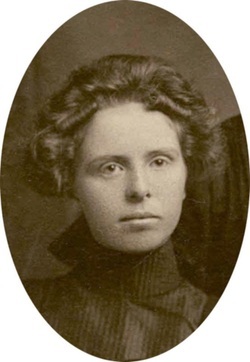 Laura Beatrice Ryder was born in Petrolia on the 25th of December 1883. She was a Christmas gift to James and Frances. Laura was four years of age when her widowed mother removed them from Petrolia and returned to her native home of Acton. Like the others in the family Laura had good grades in school. As she matured, she grew into an attractive young woman and talented toward business as well. Laura at one time owned and operated a grocery store and ice-cream parlour, which she sold to Harold Wiles around 1911. Laura had married by this time and was beginning a new life and family. Mrs. James Ryder requests the pleasure of your company at the marriage of her daughter Laura Beatrice to Robert Elgie on Wednesday afternoon, October thirteenth, nineteen hundred and nine, at three o'clock, at their home corner Mill and Wellington Streets Acton, Ontario. The wedding took place as mentioned above on October 13th, 1909 at the home of the bride. The local paper described the wedding as follows. Yesterday afternoon at three o’clock two of our popular young people, Mill Laura Beatrice Ryder, daughter of Mrs. James Ryder, and Mr. Robert Elgie, ticket agen of the G. T. R. (Grand Trunk Railway) depot, were joined in the bons of holy wedlock. The ceremony was performed by Rev. J. C. Wilson B. A. The bridal couple stood in the parlor before a bank of floweres, ferns and similar, - and were unattended. The wedding march was played by Miss Wardell, of Hamilton, cousin of the bride. The bride was attired in her travelling suit of taupe, with black picture had. The groom’s present from the bride was a handsome gold watch and fob. The guests were contained to the immediate relatives of the contracting parties. After the dainty wedding repast was served in the dining room, which was decorated with pink and white carnations, and receiving congratulations, Mr. and Mrs. Elgie left by the evening train for a trip east, after which they will spend a week in Mr. Elgie’s old home at Brucefield. Upon their return the will reside with Mrs. James Ryder. It took some searching, but I found Laura and Robert and their daughter Dorothy living in the town of Dunnville, in 1911. Their address was on Broad Street East, and Robert was working at the Woolen Mill and earning $720 per year. Again 1921 gave me a challenge trying to find the family. When we do not know where families have migrated it makes things quite difficult. I found them living in North Bay at 116 Jane Street. The family had grown and now there were three children. Dorothy, the eldest born in 1911 was now ten, and her younger siblings Frances in 1912, was nine and Basil in 1914, just seven. Robert, listed as a traveller, had an annual income of $2200 annually. They would eventually settle in Toronto at 4 Thorncliffe Avenue. Robert died July 16th 1961 at home. His obituary mentions that he was a retired CNR travelling freight agent. He was also a member of Nipissing Lodge. A.F. & A.M. No. 420 G.R.C. North Bay. Robert was eighty years old. Robert had a sister Annie, who survived him as well as his immediate family. The service took place at the Trull Funeral Home on Danforth Ave., in Toronto and he was interred at Pine Hills Cemetery. I have searched for Laura’s date of death, but so far I have not found it. All I know is that it was after 1965. However, i did find out that she was a young entrepreneur. Check out my blog, for March 2015. "Laura's Little Ice-Cream Parlor".